We have wholesome dairy products for your family. We feature a wide variety of local & organic milks, cheeses & eggs. 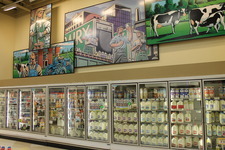 We carry Wisconsin local items like Yuppy Hills eggs, Hennings Cheese & Sassy Cow Milk.